Reserve Bank of Australia governor Philip Lowe has warned that scandals in the finance sector and flat real wage growth over the last six years are undermining the public’s confidence in important institutions, so trust must be restored to avoid a more damaging backlash against the economic and political system. Following the Hayne royal commission’s damning findings into financial services, Dr Lowe called for an overhaul of remuneration and strong penalties for financiers to incentivise a long-term service culture. But, pointedly, he said reforms should avoid deterring bankers lending money because the “economy will suffer”. “On conduct issues, we should set our expectations and standards high, and if they are not met the penalties should be firm,” Dr Lowe said in a speech on Tuesday night. On the monetary policy outlook, he said there was not a strong case for a near-term rise in rates, but the probability of an increase was higher than a decrease. The governor’s remarks are his first substantial implicit warning that politicians should not seek to over-regulate lending because credit flow was a substantial source of economic growth. Treasurer Josh Frydenberg has signalled the government does not want to cause a credit squeeze from tighter lending laws that some bank critics are pushing. In a wide-ranging, unorthodox speech for a central banker, titled Trust and Prosperity, Dr Lowe said trust in finance, improving living standards and public institutions was an “essential building block of economic prosperity”. He said the 1.5 per cent overnight cash rate had contributed to the modest lift in wages growth over the past year. “We should not lose sight of the fact that our economy, and our society, works best when there are high levels of trust,” Dr Lowe said. Amid lacklustre real wage growth across the world, partly due to technology and globalisation, Dr Lowe lamented the diminished trust in the idea that living standards will continue to improve and said it was a major economic, social and political issue. It made it harder for governments to implement necessary but difficult economic reforms. “It underlies some of the political changes we are seeing around the world,” he said, in a possible obscure reference to America’s embrace of Donald Trump’s protectionist nationalism and Britain’s vote to leave the European Union. 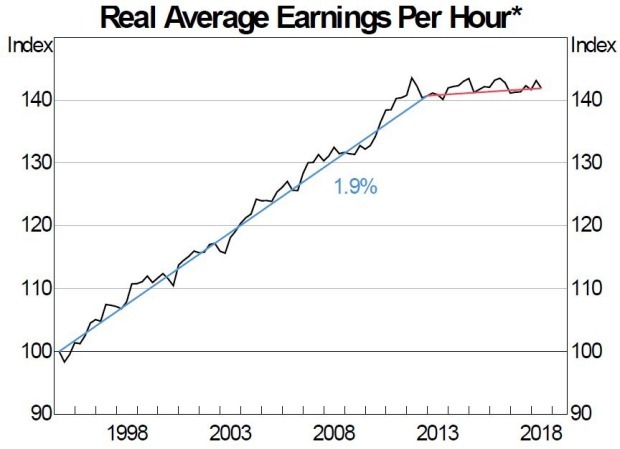 In Australia, average real hourly wages – which are adjusted for inflation – rose by almost 2 per cent a year from 1995 to 2012, but since then wages have been virtually flat. The weak wages growth jars with a strong economy that is growing about 3.5 per cent, a six-year low jobless rate of 5 per cent, high corporate profits and low and stable inflation. The RBA and International Monetary Fund both expect local wages to gradually pick up as the labour market tightens and employers compete more to hire and retain workers. Speaking at the Committee for Economic Development of Australia dinner in Melbourne, Dr Lowe justified the RBA’s low 1.5 per cent overnight cash rate by arguing it had contributed to the modest lift in wages growth over the past year. But ultimately a longer-term solution to higher wages was lifting productivity, he said. Productivity has historically closely tracked wage growth. 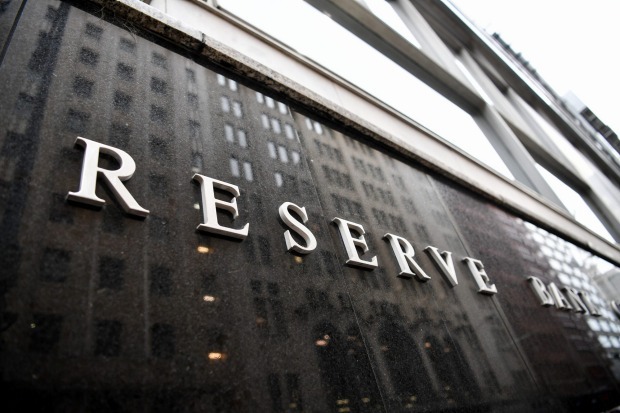 The RBA governor suggested government and business investment in education, skills and in research and development to remain competitive in a technically sophisticated world. “Realistically, more investment in human capital will not make much difference to real wages this year or next,” he said. He also noted tax reform, improving the quality and pricing of infrastructure and the strengthening competition in markets were other priorities. The IMF’s annual review of the Australian economy on Tuesday urged a switch towards more reliance on the goods and services tax and lower taxes on corporations to drive investment and lift productivity. On financial conduct regulation, Dr Lowe said the government’s Bank Executive Accountability Regime was helpful in defining clear lines of accountability, but noted it was largely limited to banks and suggested regulation was not a complete panacea. “It is unrealistic to expect that an appropriate culture can be created through regulation and penalties. Creating the right culture is a core responsibility of boards and management,” Dr Lowe said. “If the economy continues to move along the expected path, then at some point it will be appropriate to raise interest rates. This will be in the context of an improving economy and stronger growth in household incomes,” he said.